Rec and Park offers two terms of classes during the fall season, called Fall I and Fall II. A million thanks to the 1,000 or so guests who came to our September Cinco de Noe party celebrating the five-year anniversary of Upper Noe’s grand remodel. The day was hot, prompting some activities to be moved into the gymnasium. Many kids were seeing the inside of the rec center for the first time while building with giant blocks in the Imagination Playground. Outside, music lovers packed into the shady spots to soak up the tunes and visit information tables. 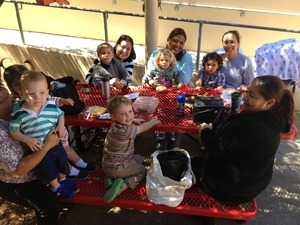 Nearly two dozen community organizations and local schools St. Paul's Elementary and James Lick Middle School set up tables and introduced themselves. More than 50 local businesses contributed with cash and raffle items. All told, Friends netted nearly $4,000 from the event. Hundreds of raffle tickets were sold, raising money for more tot concerts, more movie nights and more newsletters to let you know what’s going on. The grand prize---a baseball signed by San Francisco Giant’s pitcher Tim Lincecum and four tickets to a game---went to neighborhood volunteer Allison Muir. 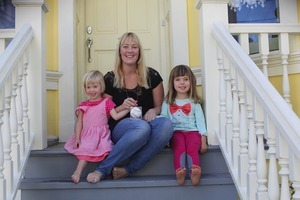 Muir and husband Jack Matthew are looking forward to taking their daughters Hazel, 2, and Violet, 3 (pictured). The event netted more than fun and funding, though. 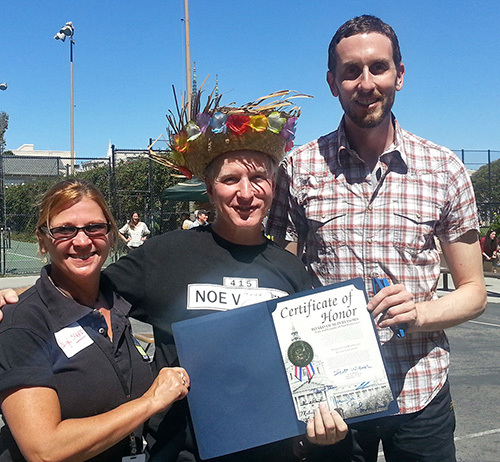 Friends received a Certificate of Honor from District 8 Supervisor Scott Wiener, who praised our efforts as a neighborhood volunteer organization. And Rec & Park employees, who pulled out all of the stops to make this a great event, were rightly praised by their boss, General Manager Phil Ginsburg. Party organizers got a plug, too: Ginsburg called Friends of Noe Valley Recreation Center and the Upper Noe Community Recreation Council the best run community organizations of this type in the city, calling them a model for others. SF Police Officers Association, K9 Scrub Club Inc, Pete Brannigan Real Estate, SF Giants, Noe Valley Pet Co, Omnivore Books, La Ciccia Inc, Pomelo Partnership, Twin Peaks Pizza, Toast Eatery, Laurel Realty, Compassionate Community Care, Pritikin Museum, Easy Breezy, Russo Music, Xcelerate Salon, Dr. Sam Rhame at MoreMojo Studios, Church Produce, Fonda Custom Shoes, Chuck's Sun Valley Grocery, Curator, XO Café, Purple Iris Healing Center, Kitami Ropa, Getzwell Pediatrics, Olive This Olive That, Gallery of Jewels, Regional Gift Baskets, Wink, PetPicasso, Video Wave, Kitchen Sync, Lara Monroe Dogwalker, Golden State Warriors, Henry's Hunan, Lehr's German Specialties, KeyKraft, Lovejoy's Attic/Tea Room, Small Frys, Cole Hardware, Davids Tea, Chocolate Covered, Cliché Noe Gift Store, Critter Fritters, Sparks Creativity, Bricks For Kids, San Francisco SoccerTots, Little Folkies. Traditional Americana group The Probabillies will return to Upper Noe to dazzle the tots with fiddles, guitars and mandolins on October 19 from 10 a.m. to noon in the playground. The Probabillies play a high-energy blend of traditional reels, waltzes and all the 19th-century sounds of Appalachia, Scotland and New England. Much of the 20th century’s popular music can trace its roots to this Americana tradition. Upper Noe's monthly tot concerts are free, courtesy of Friends of Noe Valley Recreation Center. The heat really got to these hounds. Who do they think they are? 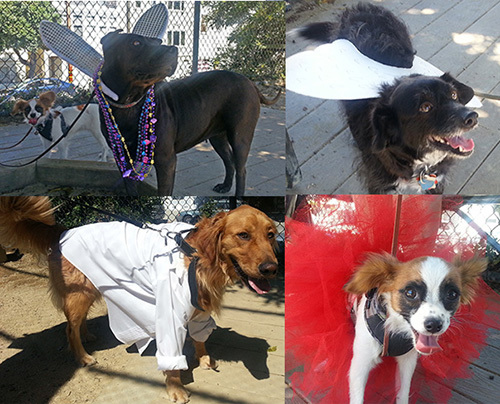 Contestants in the Cinco de Noe Doggie Costume Contest, that’s who. A co-ed flag football team for 8 to 10-year-olds was formed at Upper Noe too late to get into the fall catalog, but it’s not too late to sign up. Flag football in a non-contact sport, designed to build fundamental passing plays and proper technique. The kids practice on the Upper Noe field Tuesdays from 4:30 to 5:30 p.m. and play games Saturday afternoons at Potrero Hill Recreation Center or Boxer Stadium in Balboa Park. The season ends with a championship game November 3. Participation costs $75, though scholarships are available. Register at the rec center office or by calling 415-831-6800. Sitting in the back of the rec center got a lot more comfortable last month after Friends of Noe Valley Recreation Center bought a picnic table for the Sanchez-street side of the facility. The ADA-compliant table is designed for outdoor use and should last a long time. Fall season is long enough to warrant two sessions, and what is known as Fall II will start around the end of October. There are still plenty of open classes: Petite Bakers, Pastry Arts, Movin’ and Groovin,’ Pilates, and weekday tot soccer. To see course offerings at Upper Noe specifically (or any one recreation center), go to www.sfreconline.org and click the "Browse Programs" tab. Go to the bottom of the lefthand column and choose "Advanced Search." Select all courses. When the listings pop up, a pull-down menu on the upper righthand side allows you to narrow choices by facility. When you click on each class, you will see how many slots are left in that class. You can also register in person at Upper Noe Recreation Center. Upper Noe plans to host a bazaar Dec. 14. Organized by the same folks who pulled together Cinco de Noe---the Community Recreation Council and Friends of Noe Valley Recreation Center---the afternoon is just now taking shape. Short animated features for the kid to watch while parents peruse tables of handmade holiday crafts? A pop-up gallery of historic neighborhood pictures? Music? We know there will be cider and cookies, but please join in and help us plan the rest! 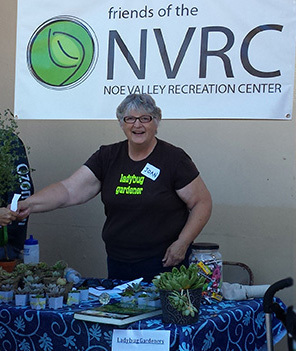 To get involved, contact info@noevalleyreccenter.com or call 415-970-8061 and ask for Cheryl. • Help advise the city on what classes should be offered at the Upper Noe Rec Center. Serve a term on the Upper Noe Recreation Center’s Community Recreation Council and help shape programming at the Center. A teen member is still needed! Please contact Cheryl Woltjen at 415-970-8061. The form is available on our website and at the center. Please either drop it off or mail it to: Cheryl Woltjen, UNRC, 295 Day Street, SF, 94131. • Garden at the Park. 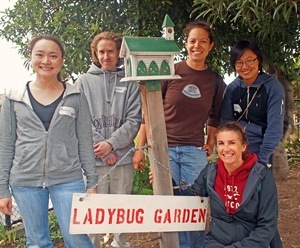 Help keep the park beautiful by volunteering with the Ladybug Gardeners on the second Saturday of each quarter. The last date this year will be December 14. All ages welcome, no experience necessary, community service hours credited. Even an hour would be a big help! Please contact us at info (at) noevalleyreccenter.com. The 8 Washington Street debate (Props B & C). Proponents and opponents of the proposed housing development opposite the Ferry Building will make their cases. Help shape programming priorities at Upper Noe Rec. Get the little toes tapping to the tunes of The Probabilities. Haunted house, carnival rides, games, costume parade and live entertainment, all for $8 a person. For more information, visit www.sfrecpark.org or call 415-831-6800. More than 50 Bay Area artists and crafts people will display and sell their creations just in time for holiday gift giving. Live music on two stages, a pumpkin patch, hay rides, jumpy tents, balloon artists, face painters, a dunk tank, a henna artist, a dog costume contest and a children's costume contest.